It's the 21st Century apparently, so why not come join the Facebook group of the blog of the music. It's what people from the future do. "Because Midway Still Aren't Coming Back" on Facebook. 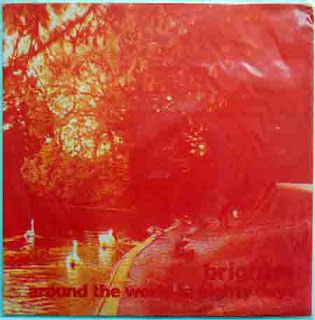 Back to Brighton and Sarah Records again today with Brighter, a lovely little three piece who briefly illuminated the indie scene from 1989 to 1992 with Keris Howard on vocals and guitar, Alex Sharkey on bass and Howard's girlfriend Alison Cousens on keyboard. For a change the internet knows a lot about the band; an interview on the marvellous Penny Black site with Howard and reveals his musical tastes as the usual Smiths and OMD and shows his thoughts of forming the band - more for the thrill of putting out records than performing live and hated being lumped in with other twee bands (but happy for the massive following that the band inherited); a similar interview on the Mundane Sounds blog; a bit of background from his own blog and lots more background from the also excellent Pop Matters site. Brighter is one of my Favorite Sarah bands...Thanks for the post! wow, i remember that interview! keris is so underrated. This is one of the best bands from Sarah. I'd like to be able to inject these songs directly into my blood. both tracks I dl'ed here are noisy, where do you get 'em the radio? Seems not only are Midway Still not coming back, neither are you. There's little sadder than a dead music blog. Was it kids? Marriage? Illness? Or just The Man? Hello. I am planning to re-start this at some point in the not too distant future. The past 18 months (I can't believe it's been that long) have been distracting for various reasons, and although they aren't exactly free from problems now, I've been collecting bands and records so hopefully I'll be back soon. Well wouldn't you know it? While you were busy elsewhere, Midway Still only went and came back! This time it's for real too, after the abortive effort of ten years ago. Russell Lee is still filling Jan Konopka's shoes, but Paul and Declan are still going strong. They released a surprisingly-excellent album in April 2010 titled Note To Self, and are recording the follow-up as we speak. ...is about indie bands. Proper indie bands from the late 1980s and early 1990s. When indie band were real indie bands, and when they released their music on big lumps of vinyl; like God intended. This page, blog, whatever is dedicated to remembering the unremembered bands, the ones that almost made it, the ones that noone has ever heard of and the ones who put out loads of records and faded from view; because for every Pixies, there's a Bob; for every Stone Roses, there's a Family Cat. I've been collecting old vinyl for as long as I can remember, any mp3 on here is copied (using science and magic) from the original vinyl. Music like it should be. As much as possible is rare, some is practically unique, most of it will only be remembered by 35 year-old ex-indie kids who spent too much time at indie clubs in the early 1990s and reading the NME from cover to cover. By the way, any good stories, extra details, bits of stuff you want to hear and other comments, then please feel free to get in touch.